This will be my last post on the the use of birch bark pattern as a design theme. 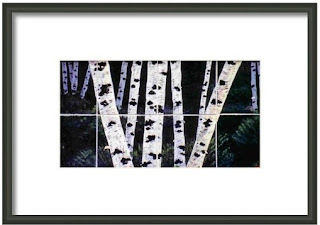 I have just two more decorative accessories that fit my qualifications of being well designed and using the birch tree theme. First is this cheese board. It is handcrafted in ceramics by Brenda Holzke and available online from Napa General Store. Great Gift! The last is a set on hand painted ceramic tiles. These can be purchased individually or in groups, or framed. They are by Dy Witt and available as a framed print from FineArtAmerica online. I'd like access to the original tiles.